The Nottingham Sailing Club was founded in 1955 at its present location on the West Bridgford bank of the River Trent. At this point the river is wide and generally slow moving. This offers some of the finest river sailing in the country. The Clubhouse is situated close to the river bank giving a good view of the sailing activities from the warmth and comfort of the licensed bar and tea bar. Changing rooms and showers are also provided. All of the land surrounding the Clubhouse is owned by the Club and provides a large secure dinghy park, plenty of space for rigging, launching from a concrete slip and a well-fendered jetty. There is also ample car-parking and barbecue and picnic facilities. The Club’s main activity is racing with Saturday and Sunday races from March to October and Thursday evening races from May to late August. There is also a Sunday frostbite series in November and December. The racing season culminates in a traditional Open Meeting on Boxing Day each year. The Club Regatta takes place every year and fills a whole weekend of social activities along with the racing and fun sailing events. Many people enjoy their membership of the Club without ever racing. You can cruise upriver for about 2 miles, mainly through pleasant countryside, as far as Lady Bay Bridge. Downstream, there is a wide section of river approaching Holme Lock. Tuesday evenings are the most popular for cruising during the summer months. There are rescue boats on the water and the bar is open for refreshments. Members may however sail at any time from the Club, which is ideal for anyone who has time available during the day. The Club is a recognised Royal Yachting Association training establishment and runs “Learn to Sail Weekends” several times each year. These courses are intensive with a high teacher / pupil ratio, giving excellent value for money. These weekends are open to non-members of the Club. The Club also runs Level 2 and Power Boat courses for Members, and for Junior Members, junior training on Saturday afternoons throughout the summer. There are many opportunities to improve your sailing skills, either crewing for a more experienced helm or by purchasing your own boat. Advice on boat handling, rigging and tuning, repairs and maintenance is readily available from most members. 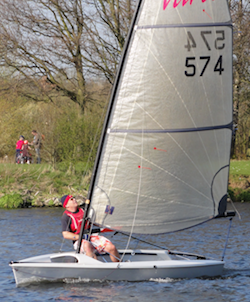 The Club owns a fleet of eight Toppers, a single-handed boat ideal for juniors. For the adults, there are four RS Visions, two GP14s, and two RS Fevas which are used extensively for teaching purposes and an Access Dinghy which is suitable for disabled sailors. Safety on the water is paramount and the Club can provide personal buoyancy aids for organised training courses. Rescue boats are on duty at these times and during racing. Life jackets must be worn at all times whilst on the water. As well as the sailing, the Club holds social events throughout the year. These cover many events not related to sailing, as well as the annual Regatta barbecue in the Summer and Prize giving Buffet in the winter. For Non-Sailing Members, the countryside surrounding the Club is excellent for walking and cycling. The National Water Sports Centre is within a few minutes walk and this offers a variety of alternative entertainments, including the white water slalom course, cafes and a childrens’ playground. Fancy a little river sailing for a change? The Nottingham Sailing Club holds several Open Meetings throughout the year and welcomes casual visitors at times when the Club is open, at a small charge.